PHP Tools add-in comes with a trial software. You can enable the trial first to see whether PHP Tools suits you. Enabling the trial or activating the software using a purchased license key gives you the full developers features. You can start with the free 30-day trial and evaluate the software. The trial can be started whenever you want, until then only the set of basic features will work. PHP Tools add-in asks to start the trial when Visual Studio starts (see below). Click Begin Trial to start a free 30-day evaluation. A dialog box appears with each new instance of Visual Studio, unless the trial has been started, the product is activated, or the dialog can be disabled in its Close menu. Trial license can also be activated from the Visual Studio menu. Click Help, and then Activate PHP Tools for Visual Studio to reopen the activation dialog. The license key can be purchased online from Pricing&Buy page. See License Comparison for details about available pricing and licenses. Note: The license key is sent by our authorized vendor Avangate. 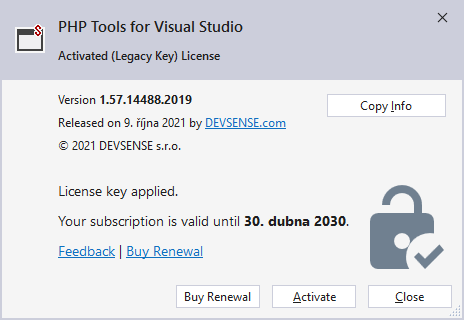 With a purchased license key, you may activate your copy of PHP Tools for Visual Studio. The product can be activated from the Visual Studio menu. 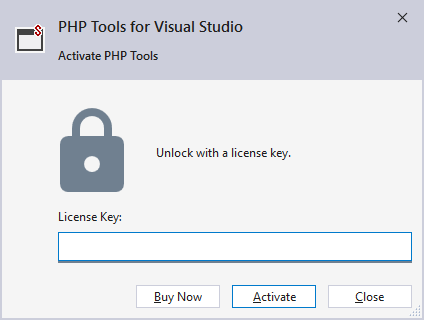 Click Help | Activate PHP Tools for Visual Studio to open the activation dialog. To review the status of your maintenance subscription, go to Help | PHP Tools for Visual Studio. This window gives you information about your license status, product version and an option to renew your subscription.